Veggie Jack O’ Lantern and 6 other festive Halloween treats! I’ve teamed up with some blogging friends to bring you a post full Halloween food creations! 🙂 My contribution to the fun is this good ‘ole veggie jack o’ lantern. Last October, I had some Halloween recipe fun with black olives. But, the spider cheeseball kinda overshadowed the other projects. So, I thought the veggie jack o’ lantern needed some love of its own! It’s easy to make and is perfect for a healthy, festive Halloween treat! 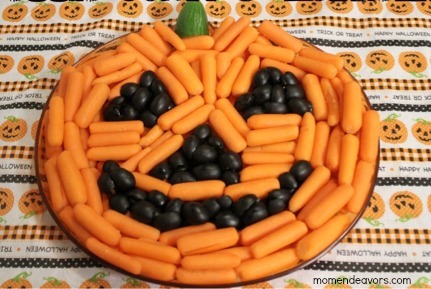 Fill a large plate/platter with baby car­rots and use black olives to make the face of the jack o’ lantern. Start by out­lining the spaces for the olives with car­rots. Once they are some­what in place, put one layer of olives down (most of them cut in half). Then to make the plat­ter look fuller & more 3D, add more car­rots and a sec­ond layer of olives. It made a big dif­fer­ence in it looking more like a pumpkin! The stem is a just a cut cucumber chunk. Super easy & a perfect, healthy option for a Halloween party! I love the diversity of the ideas! We’ve got spooky, general fall, healthy, sweet & cute all covered. Hopefully you see something you like! Now head over to their blogs and get all the directions! « Super Easy Pumpkin Cinnamon Cupcakes! Love this! Pinned it to make later in the month!